High decorative compact plant and small fruit size is ideal for potted gardens. 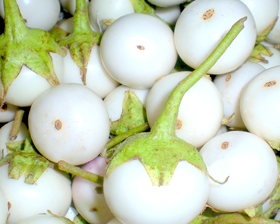 White fruits are about 5-6cm long and 4-6cm across. Produces an abundance of golf ball sized, bitter free baby fruits. Ready for harvest in 110 days. Sow February-May for growing indoors. Sow seed on the surface of a good free draining, moist seed compost and cover with 6mm layer of vermiculite or compost. Place in a propagator or seal container inside a polythene bag at constant 18-21C until germination which takes 10-14 days.